Hi y'all!!! Katie here! We have been dying to show you guys our next featured wedding, Heather and Nick. They were married on a cloudy day in May but the love was surely still shining through for these lovebirds. The overcast skies made the perfect backdrop for their photographers at Two Pair Photography to capture these deep shots full of playful light and warm color. These two definitely didn't need any help keeping their spirits high and being lively and fun on their big day. I mean...LOOK AT THEM!!! So. Gorgeous. ...but these smiles were bright. 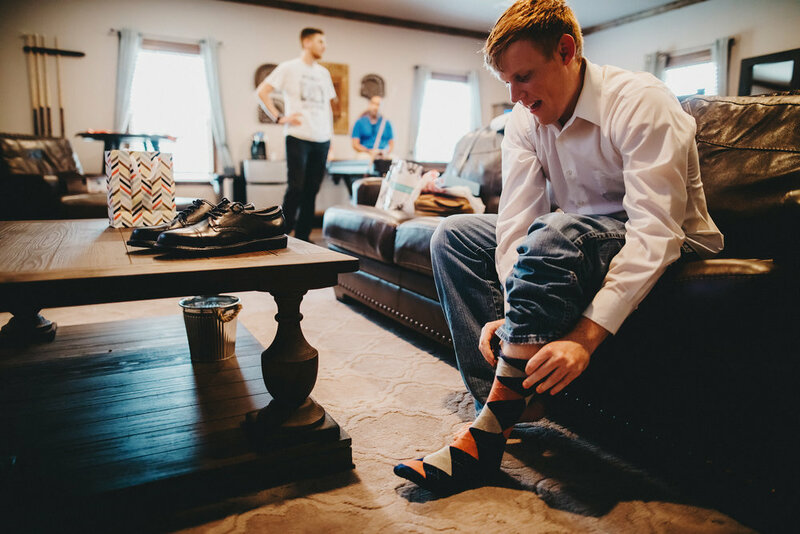 Heather and Nick started their day by spending a relaxing morning with their families and their wedding party getting ready for their big day! 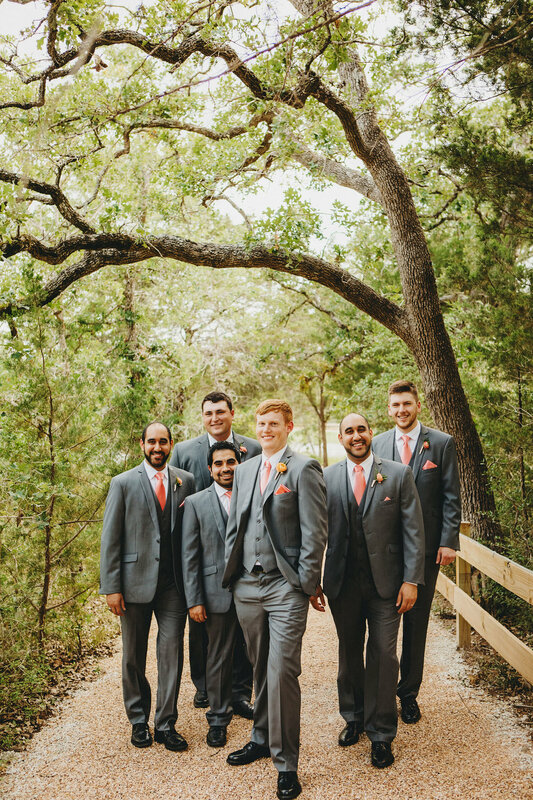 After they were pampered and prettied up, their photographer took them around the Peach Creek Ranch grounds finding the most perfect spots to snap these dreamy pics of their groomsmen and bridesmaids. We have some gorgeous natural areas on our property perfect for earthy photos like this one of Nick and his guys. But we do love those classic shots in front of our barn too!! How gorgeous are Heather and Nick and all of their wedding party!? 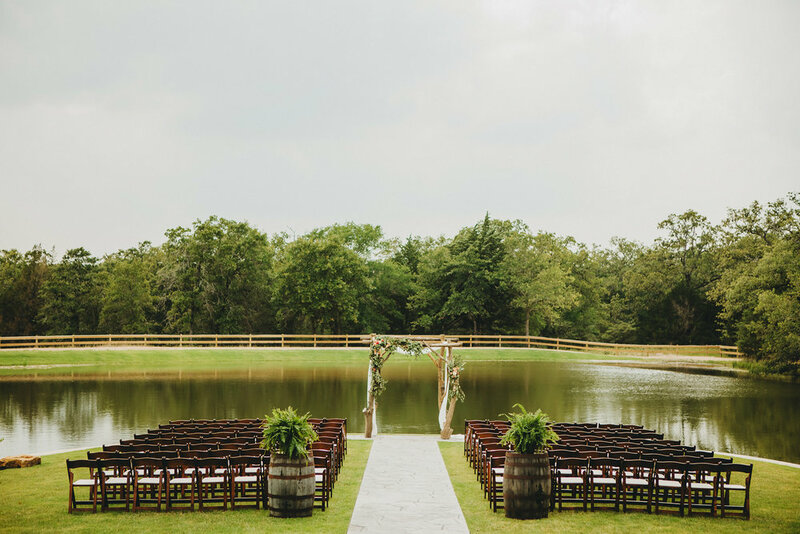 We were swooning all day at the beauty of this wedding and the people in it!!! Nick making sure he doesn't get cold feet! Before it was time to walk down the aisle, Heather and Nick paused in the midst of the wedding craziness to share this beautiful moment together. They say a picture is worth a thousand words, and this picture definitely speaks for itself. We have so many great spots to share a first look or a first touch like Heather and Nick! 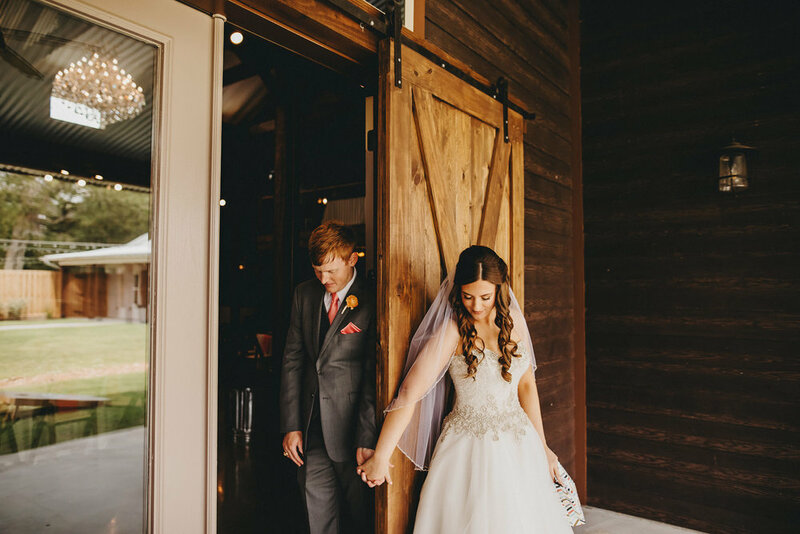 Our barn doors at the reception hall made a perfect backdrop for this special moment. We can't get over these beauties! Then it was time for one of our favorite moments...the "I Do's"!!! Heather and her father got to take a special moment before we opened the barn doors for her big reveal. These are the moments that make this line of work so worth it. Watching a father get emotional over his little girl getting married is oh so special and we love being silent spectators to these moments and so many more. One of my absolute favorite parts of any wedding is looking at the groom's face as his bride is walking toward him. Just look at the look on Nick's face as Heather was walking down the aisle. PRECIOUS!!! 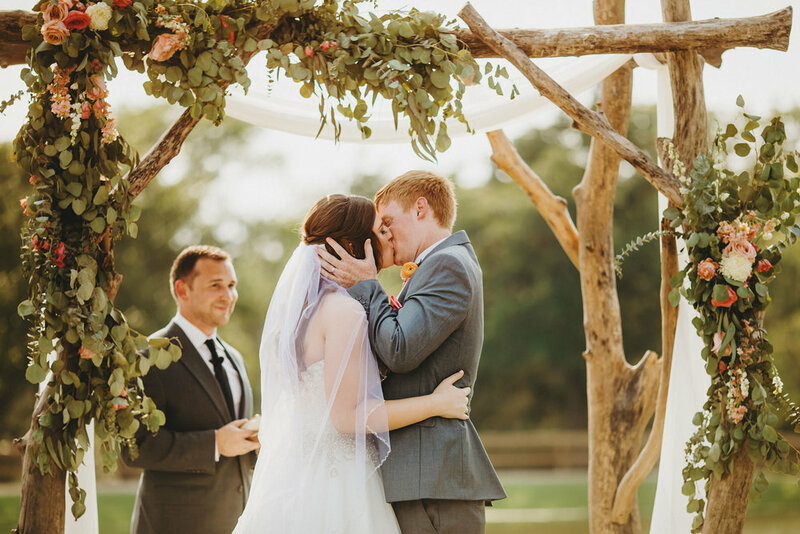 This wedding was drenched in love and magic and that first kiss shows that for sure! Their ceremony was definitely worth celebrating, and Heather had to give a lil cheer as she walked back up the aisle with her new husband!!! Then it was time to PARTAY! This wedding was dripping in gorgeous glitter and gold. 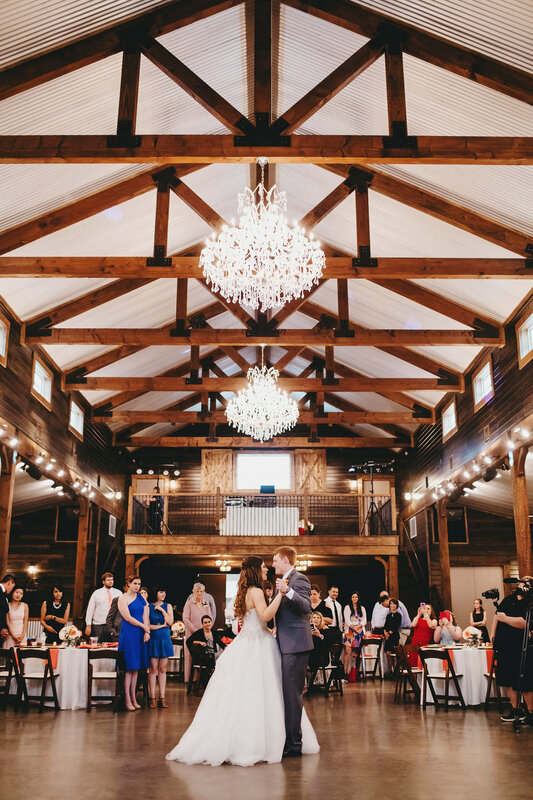 This couple turned our reception hall into a stunning backdrop to party the night away! Everything was so tasteful and b-e-a-utiful...we have been daydreaming about this decor since June!!! These table settings were simple but gorgeous with accents of peach (our favorite) and gold! We LOVE this simple decor table with gold accents! This couple and their wedding guests truly did know how to party. . .they totally danced the night away, played fun games, and shared in laughter and love. It was SO. FUN. We especially loved Heather and Nick playing the shoe game! They were asked questions like "who is messier," "who is a better cook," and other fun questions, and the bride and groom hold up the shoe for the person that corresponds with what they think the answer is. There was so much laughter, and we were definitely in stitches at this game! After a little more partying, an Aggie War Hymn, and some fun at the photo booth, Heather and Nick were sent off in style with a sparkler exit! Heather reached out to us after her wedding weekend and brought tears to my eyes! She is the absolute sweetest, and we just had to share her lovely words with y'all!!! We just LOVED working with Heather, Nick, their families and their amazing vendors! We just want to take a minute to say "thanks and gig 'em" to all of the people who made this day so special!